I am conflicted when it comes to the practice of Yoga. My decidedly secular college fills up as many Yoga classes as they offer. While I have never attended one of those classes, I feel confident that there are no mantras chanted, no chakra magic invoked, and no references to Lord Shiva or any other Hindu deity. Yoga is, stripped of the Hindu mumbo-jumbo–that’s a Sanskrit term, I’m pretty sure, synonymous with “folderah”–can provide good exercise and stretching. I do a couple of Yoga poses in my lower body strength training but without calling them Yoga. The “locust” asana or pose came to me as a “Superman.” You lie, face-down, on the floor and then lift up your head and arms at the same time that you lift your legs, leaving only your mid-section on the mat. The plank pose, basically holding yourself in an “up” pushup position, is not one of the traditional positions from what I can discover, but it is a staple of Yoga classes today. Hold either of these positions for 15 seconds or so and you’ll probably be feeling less spiritual and more shaky than before. My mixed feelings come from the very religious, very Hindu roots of the practice. 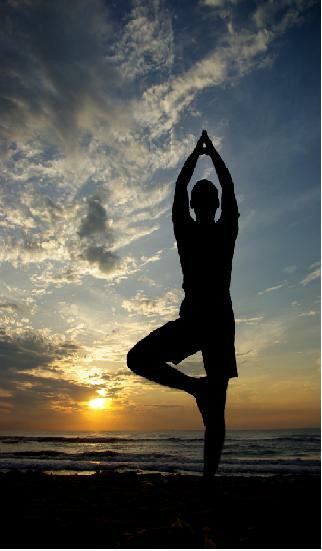 The traditional 84 Yoga asanas were supposedly created by the Hindu god Shiva. One traditional sequence, the surya namaskara, is known in English as the Sun Salutation. Essentially it is a form of worship toward the Hindu sun god. The whole purpose of Yoga practice, at least originally, is to allow the yogi (male) or yogini (female) to be able to meditate for long periods of time. This is a very religious practice in its origins. While I can use my two “poses” and not feel any risk of being drawn into Hinduism, I’m reluctant to fully explore this sort of exercise. On the other hand, I wonder at that original purpose. Shouldn’t Christians tune their bodies just as carefully as Hindus tune theirs? Shouldn’t we do our best to ensure that achy joints or finicky backs do not limit our ability to worship the one true God? When we have a living object for our worship, shouldn’t we do our best to make our bodies capable of enduring and enjoying that worship?